2 Bdrm Grnd flr Flat. Hall. Lounge. Kitch. 2 Bdrms. Bathrm (CT band - C). Garden. Parking. Price around £145,000 Entry by arr. Viewing 07816 213118 or contact solicitors. Below Home Report Valuation (EPC band - D). 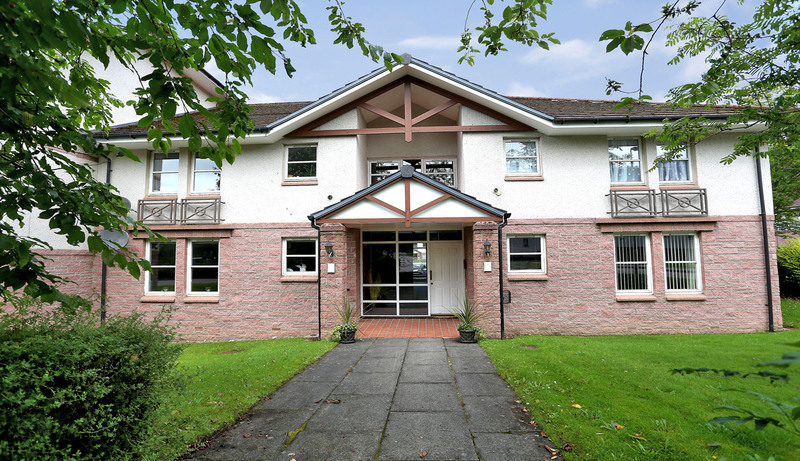 Situated within the mature grounds of a popular development along the banks of the Culter Burn and within walking distance of an excellent range of amenities as well as commuting links throughout Aberdeenshire and Deeside close by, we are delighted to offer for sale this immaculately presented two bedroomed ground floor flat. 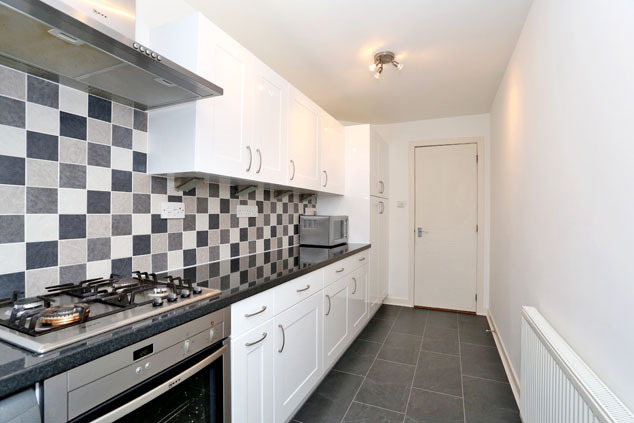 With stylish décor throughout, generously proportioned accommodation and superb upgrades, this fantastic flat will no doubt be of appeal to the discerning buyer. Internally, the property comprises of a welcoming entrance hall which leads through to a bright and spacious lounge with space for dining and continues on to the modern kitchen. 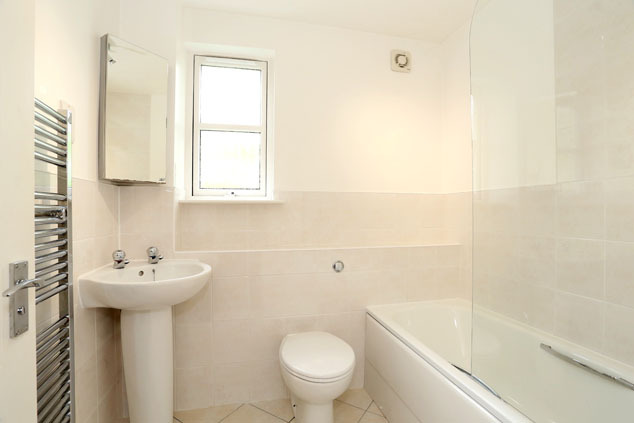 Overlooking the rear are two generous double bedrooms each with built-in storage and a bathroom completes the property. 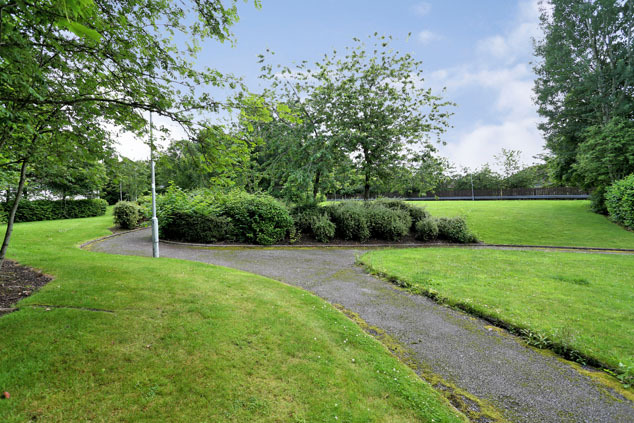 Outside, the well tended garden grounds are maintained under a factoring contract and are landscaped with areas of lawn interspersed with colourful beds and mature trees. 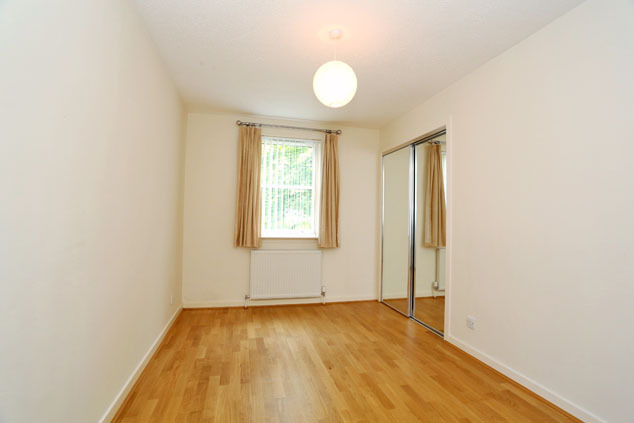 With its peaceful surroundings, excellent proportions and smart finishings, this executive flat is undoubtedly in ready to move into condition with the very minimum of inconvenience and therefore early viewing is genuinely recommended to fully appreciate all that it has to offer. Peterculter lies some 8 miles west of Aberdeen City Centre and is within easy commuting distance. There is a variety of sporting and leisure pursuits nearby. Woodland walks and walks along the Old Deeside Railway Line are also close to hand. There is a good range of local shops and amenities and an excellent primary school with secondary education catered for at Cults Academy. There is also good private schooling locally and in the City itself. 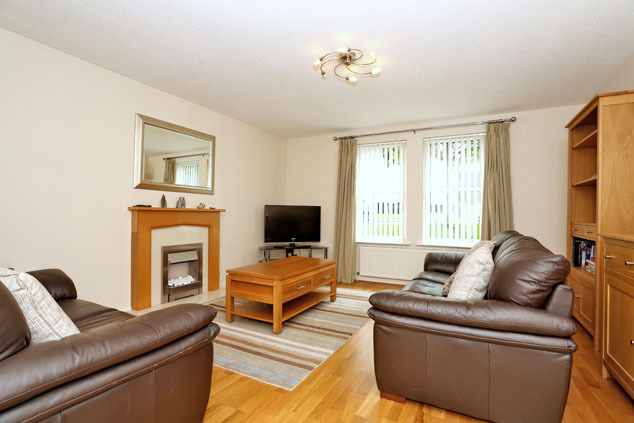 Peterculter also provides easy commuting to the Kingswells and Westhill areas of Aberdeen. Communal Hall The well maintained communal hallways are well presented and have doors to both the front and the rear. 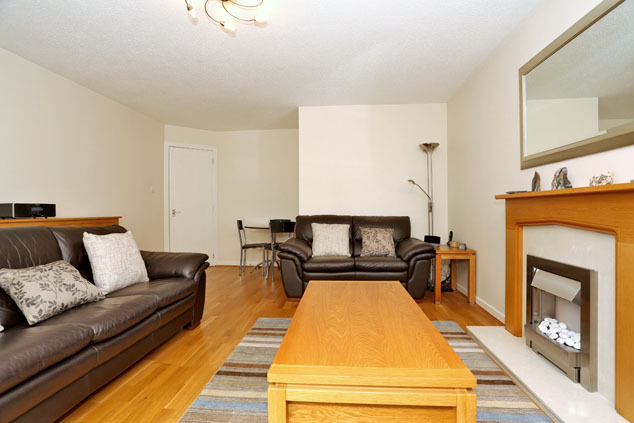 The property is kept secure, entered via a security entry system and there is ample timed electric lighting. 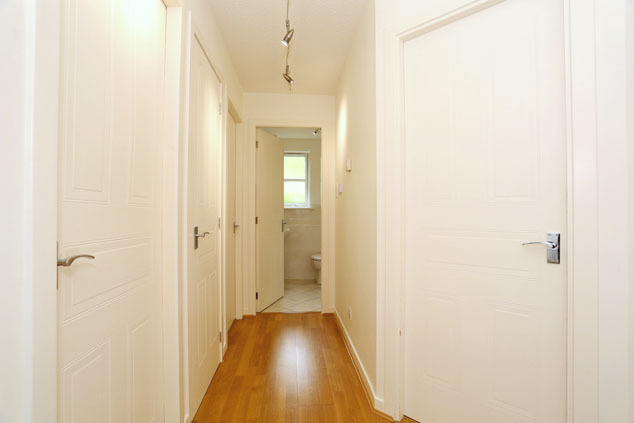 Entrance Hall A white panelled door leads into this spacious and welcoming hallway which boasts fresh neutral décor, quality oak flooring and white panelled doors lead onto all of the accommodation. 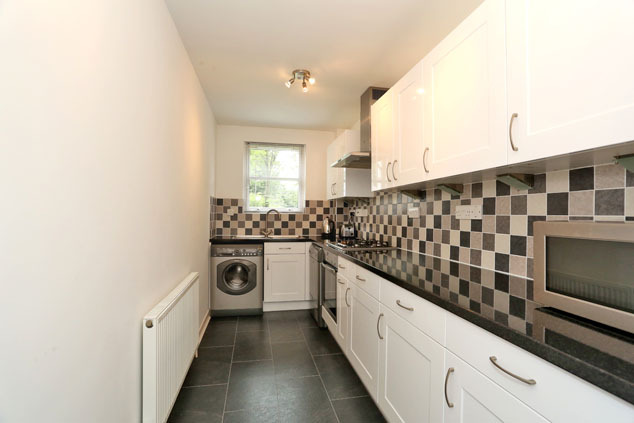 A deep cupboard provides storage and houses the pressurised hot water tank. Security entry handset. Smoke alarm. Thermostat. Lounge 18’2” x 13’11” [5.55m x 4.26m] approx. With large windows framing an outlook to the front, this generously proportioned room is flooded with natural light and is complemented with neutral décor and engineered oak flooring. The room is focussed around an electric fire with decorative stone and wood surround and the good dimensions allow ample space for soft furnishings. TV point. Telephone point. Kitchen 16’2” x 5’10” [4.93m x 1.78m] approx. This stylish kitchen has been upgraded with modern white gloss base and wall units edged with spotlights and splashback tiling and topped with a contrasting roll top worksurface which incorporates a Franke stainless steel sink with mixer tap drainer. The integrated Neff appliances include a gas hob with stainless steel chimney extractor above, oven with grill function, fridge and freezer. The free standing Hotpoint washing machine and tumble dryer will also be included. A large larder style unit provides excellent storage and houses the service meters and fuse box. Bedroom 1 14’0” x 9’6” [4.28m x 2.91m] approx. 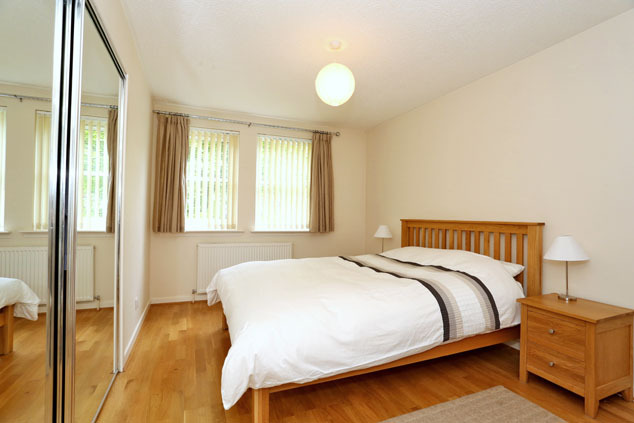 Enjoying a peaceful rear aspect is this well proportioned double room which overlooks the communal grounds. 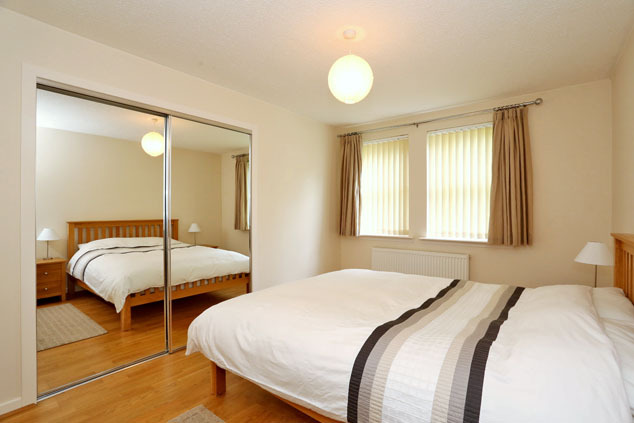 The fresh tones are complemented by natural wood flooring and built-in storage is provided by a double wardrobe with mirrored sliding doors, there is ample space for free standing furniture. Bedroom 2 14’0” x 8’4” [4.28m x 2.55m] approx. 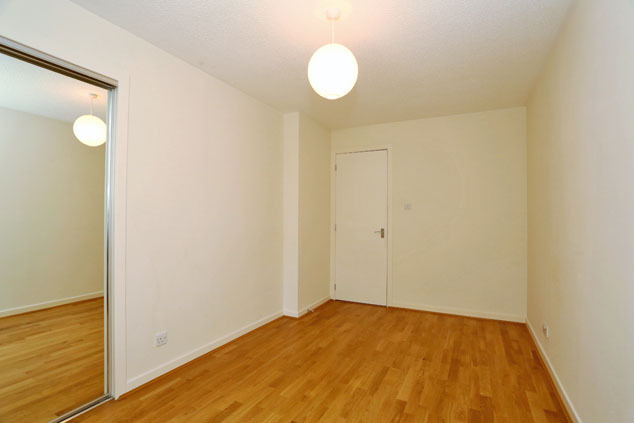 The second double bedroom has a quiet rear aspect and is afforded good natural light to enhance the simple décor and quality flooring. There is ample space for furniture alongside the built-in double wardrobe with mirrored sliding doors. Bathroom 6’11” x 6’2” [2.11m x 1.88m] approx. An opaque window to the side allows natural light into this smart bathroom which has a three piece white suite comprising a w.c., corner pedestal wash hand basin and bath with electric Mira shower above and glass screen. Finishing touches include extensive tiling to the walls and floor, low energy electric underfloor heating, chrome heated towel rail and mirrored medicine cabinet for storing small items. Extractor. Shaver point. 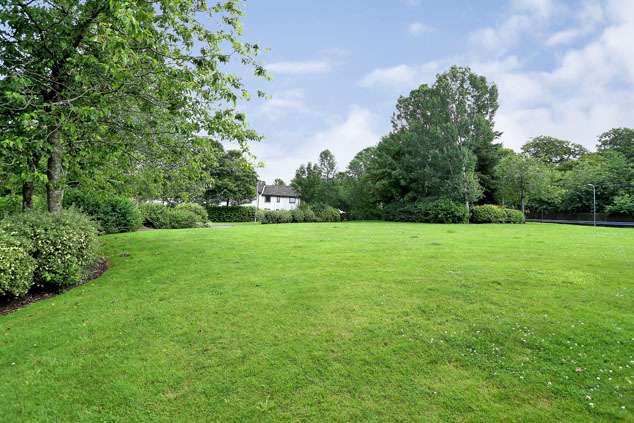 Outside This executive development is set within well tended and mature grounds with areas of lawn interspersed with well stocked borders of shrubs and trees providing seasonal colour and fragrance. Numerous car parks around the buildings provide ample residents’ and visitors spaces. Notes Gas central heating. Double glazing. EPC=D. The subjects will be sold inclusive of all fitted floor coverings, light fittings, blinds and most curtains excluding those in the lounge along with all integrated appliances and the free standing washing machine and tumble dryer.